Publication – November 20th, 2018. Korede is bitter. How could she not be? Her sister, Ayoola, is many things: the favorite child, the beautiful one, possibly sociopathic. And now Ayoola’s third boyfriend in a row is dead. Korede’s practicality is the sisters’ saving grace. She knows the best solutions for cleaning blood, the trunk of her car is big enough for a body, and she keeps Ayoola from posting pictures of her dinner to Instagram when she should be mourning her “missing” boyfriend. Not that she gets any credit. A kind, handsome doctor at the hospital where Korede works, is the bright spot in her life. She dreams of the day when he will realize they’re perfect for each other. But one day Ayoola shows up to the hospital uninvited and he takes notice. When he asks Korede for Ayoola’s phone number, she must reckon with what her sister has become and what she will do about it. Sharp as nails and full of deadpan wit, Oyinkan Braithwaite has written a deliciously deadly debut that’s as fun as it is frightening. The opening chapter of this story instantly grips you. 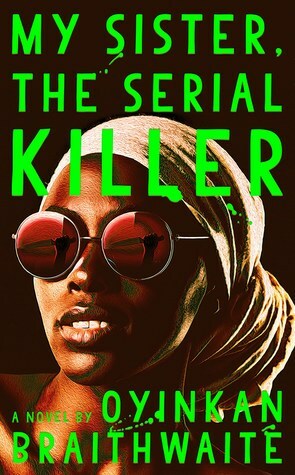 You’ll be curious and expectant to see if the book is really about the extremely bold and calling title “My Sister the Serial Killer” Let me spoil it for you here and here, it does 100%. If you’re looking for a clever contemporary dark thriller set in Nigeria, this is the book you’re looking for! Two sisters Korede and Ayoola. Korede is the main character in the story and the elder sister of the serial killer Ayoola, who is said to be a young woman of astonishing beauty, who men just want to be with and own, Ayoola knows this and uses it to her advantage. I want to say so much more but spoilers. I found the antics between both sisters very dear, the love they have for each other is very clear, and Ayoola is every inch the annoying bratty little sister who must always get her way. Korede’s persona suffers tragically because of Ayoola, and the way she views herself. I just wish Korede could have become a lot more confident about herself as the chapters grew closer to an end. The writing style is straight to the point and easy to follow, sometimes it felt like I was reading a script, but it’s all good honestly. I read it in one sitting, gobbled it all up in less than 3 hours. I feel like more could have been touched and discussed in this story, like why the characters were the way they are. We get a little background information here and there, but it didn’t really touch on their personality traits. I love that this book is set in Nigeria and I love it even more because the supposedly bad characters are women. Okay, they are terrible, but you just can’t help but be on their side, or Korede’s side, when you read this book, you’ll understand. I’m always arguing with people that there are serial killers roaming free in Nigeria, and it makes my true crime loving self very paranoid, because of how naive the average Nigerian can be despite how jaded they are about life. But people don’t believe it, and I don’t know why they don’t so many crimes go unsolved, so many deaths unexplained, especially with the hungry money loving humans, who kill people to get their body parts for rituals, do you know how many of them aren’t caught in this seemingly Godforsaken country called Nigeria. To conclude this is a solid debut and I can’t wait to read more from the author in future, because I know her storytelling and writing skill is on I can get along with. Q: To start off, could you please introduce and share with us a little about yourself? A: There isn’t a lot to say about me…My name is Oyinkan Braithwaite and I am an anime junkie. I am not seeking help for this obsession. Q: What brought about you discovering your love for writing? A: I’ve been writing for almost as long as I have been reading. I fell in love with poems and stories and I think when that happens, especially when you are young, you quickly try to replicate/re-create this love. Q: I believe a lot of people would love to know how the idea for My Sister the Serial Killer planted itself and got you writing it? A: It was the black widow spider – this creature who would kill her mates if she was hungry and they were close by. There was something cruel and reckless about it and I was immediately fascinated. Q: Both sisters have unique personalities, but I’m highly interested in how Korede is. Is her obsessive nature when it comes to cleanliness symbolic and if so could you explain why? A: I think her obsessive cleaning is a coping mechanism. Her life is messy, impure and she attempts to set this to rights by making sure nothing is out of place in her immediate environment. Q: How would you say the reception from Nigerians whom you’ve come across that have read My Sister the Serial Killer is? And if it was up to you how would you persuade others to read it? OYINKAN BRAITHWAITE is a graduate of Creative Writing and Law from Kingston University. Following her degree, she worked as an assistant editor at Kachifo, a Nigerian publishing house, and has been freelancing as a writer and editor since. In 2014, she was shortlisted as a top-ten spoken-word artist in the Eko Poetry Slam, and in 2016 she was a finalist for the Commonwealth Short Story Prize. She lives in Lagos, Nigeria. Yeah it could, thank you for reading! Adding this straight to my TBR. Beaut review and Q&A!